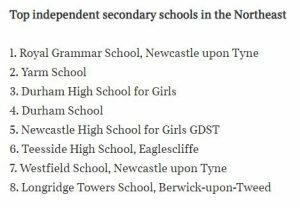 Teesside High School has once again been recognised as one of the top ten best performing independent schools in the North East region by the Sunday Times. The school has climbed a further two places to be ranked 6th, the highest placed of any non-selective school in the region. This follows the school’s outstanding high grade results in 2018, including record A*/A achievement at A-level and over half of all GCSE entries securing prestigious A*/A/9/8/7 grades. Kirsty Mackenzie, Head at Teesside High School, said: “We are beyond proud to feature so highly in The Sunday Times independent school league tables. “As a school which does not select students on academic ability, to see Teesside High School performing so competitively at both A-level and GCSE is a huge affirmation of the hard work and dedication of our staff and students, and of our inclusive school ethos on the whole. We are once again the best performing non-selective independent school in the North East. This is Teesside High’s highest ranking in recent years and shows excellent and consistent progress; the school ranked 10th in 2016, 8th in 2017 and now 6th in 2018.